Neil Gorsuch’s Supreme Court confirmation hearings must be postponed. Neil Gorsuch’s nomination cannot be separated from the serious questions that plague the administration. Supreme Court nominee Judge Neil Gorsuch meets with Maine Sen. Angus King in his office on Wednesday in Washington. On Monday, FBI Director James Comey confirmed there is an ongoing investigation of Russia’s interference with the 2016 presidential campaign, including “any links between individuals associated with the Trump campaign and the Russian government, and whether there was any coordination between the campaign and Russia’s efforts.” In early March, Dahlia Lithwick and Sonja West argued that Neil Gorsuch’s Supreme Court confirmation hearings should be postponed “until the investigations of the Trump campaign’s ties with Russia are resolved.” That piece is reprinted below. Within a few hours of Justice Antonin Scalia’s sudden death last year, Senate Republicans decreed that then-President Barack Obama could not fill his seat. Why? Because Obama had completed three years of his four-year term. The Supreme Court was too important. The voters, they contended, should decide Scalia’s successor through the proxy of the 2016 presidential election. Any other action, they insisted, would tarnish the constitutional legitimacy of the appointment. This transcendently important constitutional process, they warned, must not be rushed. If the fact that Barack Obama had a mere year left of his presidency represented a full-blown crisis of legitimacy, one so severe that no nominee he selected could even have a hearing, then how should we describe the crisis level we’re living under now? Under the Republicans’ logic, how can a presidency in which there are myriad investigations of communication with Russia during the campaign possibly be legitimate? Notwithstanding a crisis of legitimacy, the work of the presidency must go on. But the one thing that need not, and should not, go on is the one thing that cannot be fixed later: an appointment to a position of immense importance with constitutionally guaranteed life tenure. As such, the Senate must postpone Judge Neil Gorsuch’s confirmation hearings until the investigations of the Trump campaign’s ties with Russia are resolved. We know that Michael Flynn lied about his conversations with the Russians. It now seems likely that Attorney General Jeff Sessions did the same. Thus, it makes exactly zero sense to take the position that Obama’s presidency was too tenuous to hold hearings while President Donald Trump’s is on solid footing—and we must proceed with haste. Nobody in the Senate can plausibly take the view that Trump’s claims to the White House are more legitimate, more publicly accepted, and more robust than were Obama’s in March 2016. But this isn’t about seating a Cabinet official or signing an executive order that can be reversed in the future. This is about the Supreme Court. If the Trump victory were even somewhat abetted by shady ties to the Russians, everything he does as president is of questionable legitimacy. Once a Supreme Court appointment is done, it cannot be undone. And the damage won’t stop with Trump’s judicial nominee: Having one justice serve under a cloud of doubt also threatens to harm the entire court. As the only unelected branch of government, the central pillar supporting the court’s powers is its legitimacy. Because they cannot be checked by the voters, the justices’ sole claim to legitimacy is the constitutionally mandated process that puts each of them on the court. That process, the Constitution explicitly tells us, is that the president nominates while the Senate advises and consents. In this instance, both steps have been deeply compromised—first by the Senate Republicans’ refusal last year to hold hearings on a duly nominated candidate and again by a new nomination from a president who might not have a valid claim to the office. (Not to mention that this is a president who has expressed open contempt for the independence and legitimacy of the judicial branch.) The only acceptable answer at this point is to hold off on the Gorsuch hearings until we can be sure that this president, and this nomination, are on the up and up. To be clear, none of this has a thing to do with Gorsuch as a person, a nominee, or a judge. The GOP’s claim as to Judge Merrick Garland was that his fitness was never at issue—it was a fight over Obama’s legitimacy. Gorsuch should be tested against the very same standard. His dignity as a nominee and his fitness for office are immaterial. The question here is about the legitimacy of the nomination itself. The nomination of Gorsuch to the Supreme Court cannot be separated or shielded from the serious questions that plague the Trump presidency. The nomination itself does not somehow float above the fray, occurring on a parallel track of governance that is still bound by norms of respect and dignity and the benefit of the doubt. Last spring, Senate Republicans claimed that Merrick Garland was a perfectly nice jurist, one who was irredeemably tainted by his connection to Barack Obama. As a result, Garland was allowed to sink below the radar of all constitutional norms and mandates. Likewise, Gorsuch is a perfectly nice jurist, one who is—perhaps equally unfairly—now tainted by his connection to the unfolding scandal around the Trump presidency. His nomination should not be allowed to sail above all constitutional norms and mandates. 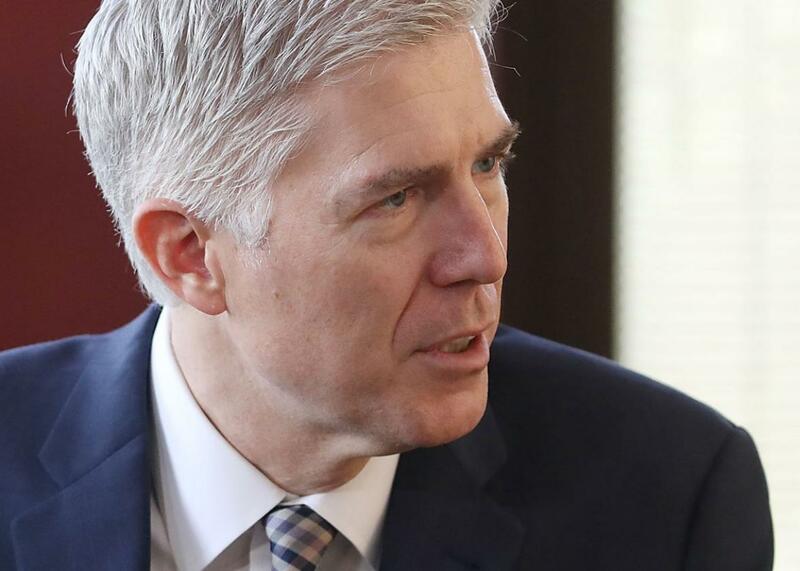 The same rule that held for Garland should be enforced for Gorsuch: Until the presidency is no longer under a cloud, there can be no hearings, and there can be no votes.